Just yesterday I was thinking how you hadn't posted anything in a while. How nice to see this today. I also prepared a long reply to you, but it turned in to winding nonesense, so let's leave it there. Thanks! I had planned to write a bit about all the reasons I haven't posted lately but ended up taking it out as mostly irrelevant — most of this blog's visitors are not regular readers. I am now treating this blog as “I'll post when I have something to say” instead of trying to post at a regular schedule, and a “blog” format is not ideal for this, but I'll keep using it until I find something else. This is a pretty reasonable interpretation of Crafting. It's something I am struggling to justify in my own game. 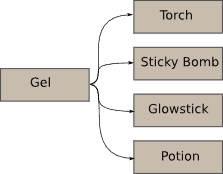 I want to introduce crafting as a mechanism to increase 'continued play' value, but I simply cannot imagine the items that could be created. 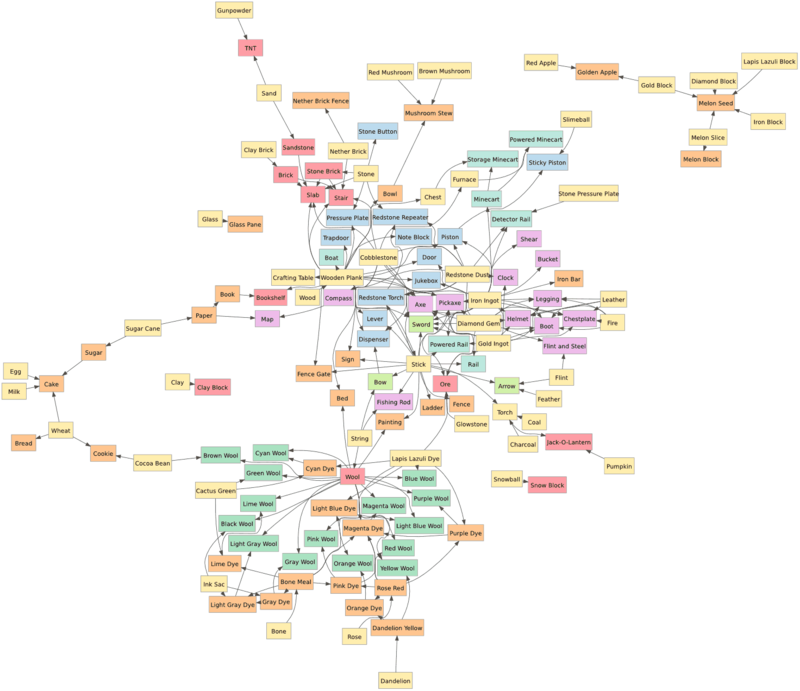 I wrote a tech tree for one of my prototype games earlier this year and a tree structure was the obivous choice for me. Specially as most recipes are only unlocked after cooking certain recipe. But that tree didn't cover raw materials. In a sophisticated system i'd directly notify the player about new recipes available. Minecraft has you! Maybe you could design a rudimentary mod for MC that gave a secondary inventory type screen that would track goals and display craftable things. It might be better to think of crafting as a Petri net (http://en.wikipedia.org/wiki/Petri_net). That way there are algorithms to check for things like "infinite mass"
Adam: I agree, it's not a plain graph; each game will attach semantics to the nodes and edges. Many games will have AND nodes ("you need wood AND ore"). WoW includes preconditions ("you must be level 65 and carry an adamantium rod"). Minecraft requires parts to be arranged on the grid (if I understand correctly). Dwarf Fortress has OR nodes ("you need ash wood OR pine wood to make a bed"). Petri nets or linear logic may be be reasonable choices for expressing these, but it'll vary by game. It has been more than a year. I was starting to worry that you were going to leave this blog to die. What are you working on rigth now? Hi Draco! Yes, I'm still around, but family and work kept me busy most of the year, and I didn't have a lot to write about here. What am I up to? I've been looking at how I learn and I find that going back and forth between reading and doing helps a lot more than only reading or only doing. I asked myself a few years ago: why are web articles formatted just like print articles? We have linking, forms, and interactivity on the web, but very few articles take advantage of that to help people learn better. I have lots of topics I want to write about, but I want to learn some more about interactive diagrams so that I can create really good ones to incorporate into my writings. nearly all sites as a consequence I'm aiming for something exclusive. P.S Sorry for being off-matter but I had to ask! As a final point , give permission me thank you for your patience with my English as (I'm persuaded you have figured this at this moment ,), English is not my first language therefore I am using Google Translate to shape out what to note down what I truly have in mind to voice. Hi Anonymous: this page is posted through Blogger. I used Blogger/Blogspot because it allows extensive customization by allowing me to edit the HTML template directly, and I don't have to run a web server of my own. I've customized my template to match my non-Blogger web site as much as possible. I usually write my blog posts with Markdown, which converts to HTML, which I copied into Blogger. The graphs were made with Graphviz, which converts to PNG, which I uploaded. Cheers, Amit! It's been a long time, but I'm glad you're still into game programming. I've got some Flex experience now and am thinking about warming up some of my old game ideas.